A lead lid designed for sealing drug jars is kept in the Archaeological and Ethnographic Museum of Zlato­grad. The diameter of the lid is 23–24 mm and the side rim is 2 mm. The figure of a running wolf is engraved on the lid. 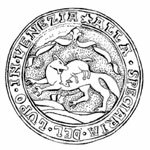 An inscription in Italian is visible on the periphery of the lid: ALLA-SPECIARIA-( DE )-LUPO-VENEZIA (The wolf ’s pharmacy in Venice) (Fig. 1). The Venetian pharmacy of “Del Lupo” is not known for the production of theriac. However, it became famous with the production of Although “empiastro emolliente magistrale omogeneo”, translated as “homog­enous softening cream”, known colloquially as “Cerroto del Sig. Antonio” or Segnor Antonio’s cream. The drug comprised resins, oils, litharge, turpentine and other minor ingredients. The pharmacy that produced the drug was registered on 13 April1682 in Saint Fillipo and Giacomo Square situated next to Saint Marko Square and was owned by the Corady family until 1745. The pharmacy is still in operation today, and it can be found in the same place. However, its name is different – “Al Lupo coronato”. The pharmacy was sold in 1745 to Franccesco Montagna, but he was not allowed to produce the drug men­tioned above. After the death of Niccolo Corady, his wife obtained the rights for the production and the sale of the salve. There is no information about the “Del Lupo” pharmacy after 1745. In 1785 a newspaper wrote about a drugstore on the same address but with a different name – “Spezieria del Lupo coronato”. At that time the pharmacy was owned by Pietro Arigio. There is no information whether the name of the drug store changed immediately after it had been sold in 1745 or later in 1785. An interesting fact is that the pharmacy’s logo was also changed. The wolf is crowned and looking to the left (Figs. 3, 4). The pictures are almost identical. The only differences are the crown and the inscription. The logo was either modernized similarly to others in this period (Fig. 5) or it was modified after the sale in 1745. The lead lid is dated back to 1682–1785, and the period can be narrowed to 1745–1785. The official market price of the drug was 10 soldi per 1 ounce. This was a relatively low price compared to the prices in the Ottoman Empire during the first decade of the 18th century when it would have cost 7 or 8 akÇes. If the price of one oka of bread (between 1700 and 1730) was between 3 and 5 akÇes including transpor­tation fees and the dealer’s profit, the price of the drug would have still been affordable. The salve was aimed for external use, for tumors and buboes treatment. Treatments for buboes were par­ticularly relevant during the bubonic plague, a bacterial infection which killed many people in the 18th century.